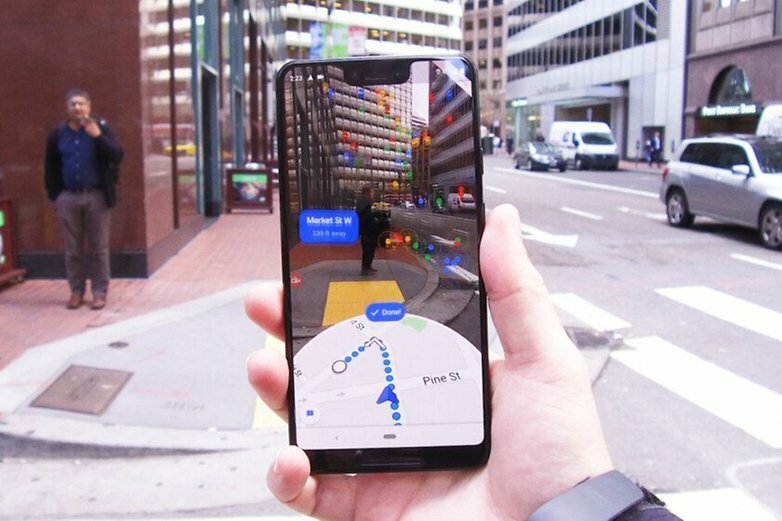 The Wall Street Journal shared the first aspects of the next AR navigation feature coming to Google Maps. In essence, when GPS is no longer sufficient, VPS technology will use the smartphone’s camera (plus a whole series of data collected by Google) to analyze the surrounding environment. In this way, Google’s algorithm will be able to estimate your position and identify where you are more accurately. In the demo shown by the WSJ, in addition to the classic directions button there is also the new Start AR option. This allows you to replace the classic map with a real-time view of the world around you, along with the traditional 2D/3D aerial map. Users will first have to point the camera at the various areas of the surrounding environment: in this way, the algorithm will be able to recognize some reference points to accurately estimate where you are. In essence, the app will recognize all those landmarks that Google has acquired over the years thanks to the images and data that the company has collected with its Street View cars around the world. Later, Google stated that this feature is designed primarily for walking directions and should not be used while driving. It also contains some useful features to preserve battery life and data usage. For example, if your smartphone no longer points to its surroundings, the classic 2D/3D map will be displayed and the screen will turn off after a certain period of time. Unfortunately, the least exciting part of this Google Maps feature is that we users will have to wait a little longer before we can try it on our smartphones. Are you also looking forward to navigating your city in augmented reality? Let us know in the comments.